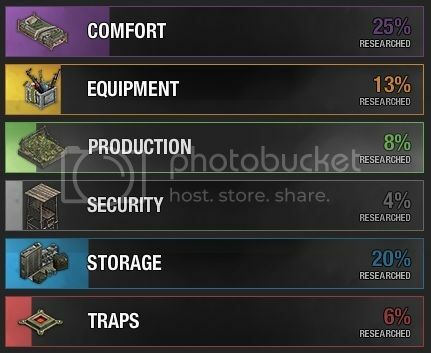 Show Us Your Research Progress! Edited by Pro_Tyle, 08 January 2016 - 12:57 AM. I am currently researching my material storage. 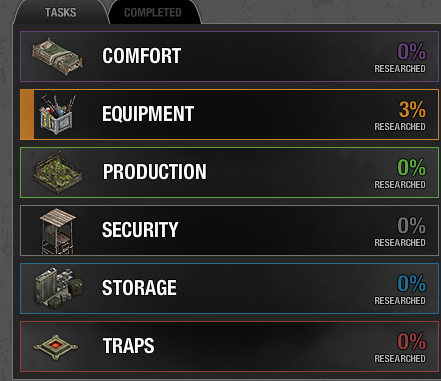 Edit: I traded for most of my notes and research components so i could keep progressing otherwise i would have half of those %s. Edited by NeroVirgil, 05 January 2016 - 07:35 PM. Edited by MW3ProPiper, 08 January 2016 - 12:35 AM. Equipment, Production (specifically the fuel generator), and storage are currently my primary focus. May I say, another great idea with the Research, Con. Any special prize for the first one to 100% on all? Even if it's just a nice mention on the forum. why did you choose not to do those? Edited by Lee R C, 05 January 2016 - 02:11 AM.